A Duck Race at Crows Nest Cottage – where did they go? This year, as last year, we had visitors in the garden. A pair of Mallard ducks have decided that the corner of our herb patch is a good place to build a nest and to have a brood of ducklings. Just as last year, a deep hole was scraped out and for over 4 weeks, the female mallard religiously sat on her nest, with not a sign of any eggs. It was only when she made her twice daily short walk to the ponds for a feed and a wash and preen that we were able to spot some 5 eggs cosily nestling in a bed of duck feathers. 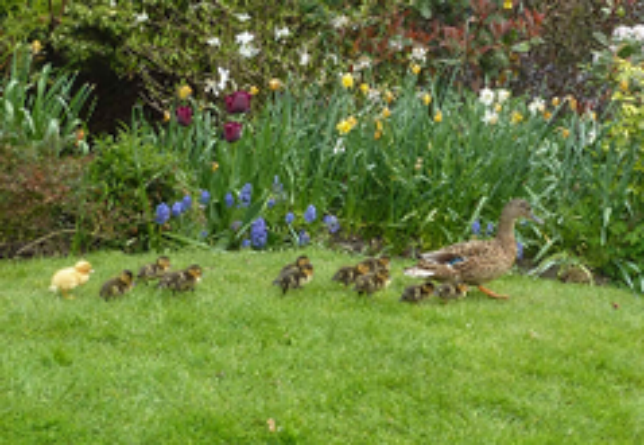 It was therefore with surprise and delight when we woke on Easter Monday’s sunny morning to find that she had hatched twelve ducklings (just as last year), probably the day before! Eleven were Mallard coloured (brown with some yellow stripes) but number twelve was bright yellow. I wonder if she had had another suitor!! We sat and watched her introduce them to the ponds and saw them launch themselves fearlessly into the water. Every now and again they would climb out and huddle under her breast to keep warm but most of the time they were happy to swim around and jump in and out, always keeping close to their mother. We were please that a few children were around to see them but after three or four hours, she took them for a walk round the garden and despite following them, we didn’t see where they went but they were gone! I wonder did any of you see them walking down the village, perhaps to the lake or water splash?